Codes of conduct are statements that commit organizations, industries, and professions to particular moral values and beliefs and define appropriate behavior for employees and professionals. 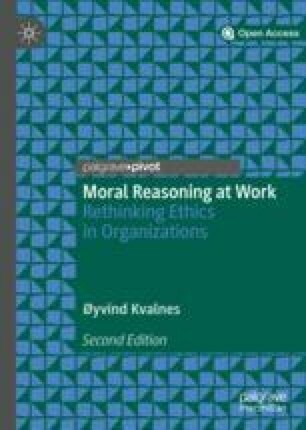 This chapter explores how codes of conduct can affect moral reasoning and behavior in the workplace. On the one hand, they clarify the scope of action available to decision-makers, but on the other hand, they can incentivize people to identify and exploit loopholes in the codes. When organizations structure ethics around a set of codes defining appropriate behavior, it can create an unforeseen and unwanted form of creativity. Loophole ethics is the activity of remaining loyal to the letter of the code of conduct and assuming that any action that the code is silent about is morally acceptable, or at least not required. An alternative to operating with codes of conduct of increasing complexity is to make the principles simpler and more general, thereby leaving more room for the use of personal and common judgment. Use of bicycles, running wheels, and rollerblades not allowed. Use of chewing gum not allowed. Eating and drinking on the playing field not allowed. Climbing on the fence not allowed. All users are required to remove tape, bottles, and other litter. Use the litter bin. Smoking and use of fireworks not allowed. Consumption of alcohol and drugs not allowed. Use of litter bins as goalposts not allowed. This is a rather detailed list of acts that people are forbidden or required to engage in when they are on the premises. It may work as intended in regulating the behavior of users and visitors, but one possible side effect may be that it provokes a particular kind of creativity. When people are presented with a long list of rules delivered in a strict and authoritarian manner, it can lead them to explore alternatives that are not mentioned in the list. This sports arena sign, for example, is silent about riding horses, setting up tents, or firing up a barbecue. The rule-makers cannot really complain if one pursues these options, as they have not articulated rules against them. This chapter addresses the phenomenon of loophole ethics: the activity of responding to a set of codes, rules, and regulations by trying to identify and exploit loopholes in it. The assumption behind loophole ethics is that any action that the rules are silent about is acceptable. Loophole ethics occurs in a range of settings, particularly in social environments in which the rules and codes are comprehensive and specific. Rule-makers put considerable effort into defining what is allowed and outlawed in social behavior, and people who live in accordance with the rules can sometimes get the impression that further moral reasoning is not required from their side. Someone else has done the thinking for them and set out the scope of action for morally acceptable and required behavior. Loophole ethics also feature prominently in organizations that have a compliance approach to societal responsibilities. Here, people set out to comply with rules and regulations and consider themselves free to pursue activities not specifically mentioned. Loophole ethics can occur prior to a decision to perform a particular action and afterward as justification for an action. An appeal to rule silence can be part of individual and group deliberations about what to do next. Ex ante loophole ethics can start from the question, “Can we really behave in this manner in this particular situation?” An affirmative answer rests on the observation that the chosen alternative does not constitute a break with any code or rule. Therefore, choosing the alternative is still technically compliant with regulations. Ex post loophole ethics justify past conduct by issuing a similar appeal, that no deviation from the relevant code of conduct took place. Loophole ethics for acts: As the set of codes, rules, or regulations does not forbid this option, it is ethically permissible to pursue it. Loophole ethics for omissions: As the set of codes, rules, or regulations does not require this option, it is ethically permissible not to pursue it. Loophole ethics with regard to omissions can take the form of not helping or supporting a colleague, not speaking up against an injustice at work, or not informing a client about particular defects in a product because the rulebook does not specifically require it. Organizations that set out to formulate a set of codes, rules, or guidelines to define appropriate and expected behavior from employees should be wary of creating a loophole ethics mentality in the process. A code-based approach to organizational ethics has considerable merits, as everybody can, in principle, know up front what is morally required and expected of them at work. When they are in doubt, they can consult the code and find guidelines there about whether they can accept a particular gift from a supplier, invite a customer to a dinner and pay the expenses, participate in decision-making in which a friend or relative is one of the stakeholders, and so on. Codes of conduct can generate consistency in how members within an organization behave toward each other and toward outside stakeholders. An organization with an established code of conduct can reduce subjectivity and contingency in decision-making. The code approach is nevertheless problematic. Detailed codes tend to signal that ethical issues have been considered and ruled upon, once and for all. What remains is to live by the codes, consulting them whenever one is in doubt. In reality, however, each new situation can potentially demand further moral reasoning based on the realization that the codes may be silent about particular aspects of it. There is considerable risk that people uncritically interpret the silence of a comprehensive code with regard to a particular option to mean that one is free to pursue it (loophole ethics regarding acts) or that it is acceptable to remain passive (loophole ethics regarding omissions). Hemmestad and I explored how loophole ethics can occur in sports using a story about the U.S. ice hockey player Sean Avery (Kvalnes & Hemmestad, 2010). During a match between his team, the New York Rangers, and the New Jersey Devils, Avery placed himself face to face with the opposing goalkeeper, Martin Brodeur, and distracted him by waving his hands in front of his face. Even some of Avery’s teammates saw this as unacceptable behavior and tried to stop him. An ice hockey player is not supposed to stand with his back to the play and block the goalkeeper from seeing the puck and player movements on the ice. It is a behavior that may increase his team’s chances of scoring, but it goes against unwritten, common sense assumptions about fairness in ice hockey. The new rule provides a detailed description of what Avery did and establishes that such conduct is not acceptable. With the new rule in place, the loophole Avery had found no longer existed. From now on, any player who engages in this activity will get a two-minute sending off. The new rule was quickly baptized the Sean Avery Rule. In response to the rule introduction, Michael McGeough, an experienced ice hockey referee, claimed that he could and would have penalized Avery even without the new rule (Paumgarten, 2008). In his eyes, what Avery did was unsportsmanlike. This is a very general category normally applied with appeal to experience and common sense. A less experienced referee may have thought that he has no scope of action to sanction Avery’s distractions in the absence of a concrete rule. The ice hockey authorities also seemed to share this view, as they found it necessary to introduce a new rule. Hemmestad and I argued that authorities could have been more in line with McGeough’s claim and maintained that, even without a specific rule, it was possible to penalize Avery’s action. That way, they could have signaled that the participants in their sport—players, referees, coaches, and others—cannot expect the code of conduct to provide explicit answers in every case. Each participating individual needs to make his or her own judgments and should not use the absence of explicit rules as justification (Kvalnes & Hemmestad, 2010). Curling is a sport that has integrated the application of personal judgment and wisdom. When two teams match up and compete, they do so without the active presence of a referee. The players settle minor disputes between themselves using common sense. In the unlikely event of a major dispute, the players can call upon a referee from the stands, but the normal situation is that the match takes place without any interference from a referee. Other sports can take note of how curling has placed the exercise of personal judgment at the core of its activity. A more comprehensive discussion of practical wisdom in sports can be found in Hemmestad, Jones, and Standal (2010). In contrast to the ice hockey authorities who introduced a new rule after the Avery incident, the Norwegian Armed Forces expressed trust in their own decision-makers’ common sense. It is also likely that the decision not to add more specific rules about conduct in winter exercises reduced the risk of creating loophole ethics among soldiers and officers. Ethical rules and regulations do not necessarily lead people to look for and exploit loopholes. However, there is a considerable risk that comprehensive rules may create incentives to perform actions that, according to the rule-makers themselves, are regrettable. Pogge (1992) has suggested that people should ask themselves, “Have we organized our moral commitments in a way that reflects, and helps effectively achieve, what by their own lights matter?” (p. 80) If the answer is “no,” then they should reconsider their approaches to ethics and figure out how to revise them. In organizational contexts, in which comprehensive codes of conduct appear to generate loophole ethics, there are reasons to rethink this strategy. Another setting in which loophole ethics can occur is in the relationship between insurance companies and their customers. Customers may distrust dense, small-print provider contracts and look for loopholes in response (Kvalnes, 2011). In a study of the events leading up to the financial crisis in Iceland in 2008, philosopher Salvör Nordal and I found a range of examples of loophole ethics. People in the financial industry justified their dubious decision-making by highlighting that they were not breaking any specific financial or professional regulations (Kvalnes & Nordal, 2018). Pension funds in Iceland participated in financing many of the high-risk investments that were made prior to the crisis during the expansion years. After the crash, pension fund decision-makers were criticized for gambling with public money, going fishing, traveling abroad, and participating in excessive partying with bankers and CEOs. The fundamental problem was that they were too closely involved in social activities with individuals with whom they should have had detached professional relationships. When pressed for justification, they could more or less correctly claim to have breached no rules (Kvalnes & Nordal, 2018). As noted in Chap. 6, a loophole mentality is also present when people justify their decisions by appealing to the fact that they have not acted illegally. The asymmetry in the legal domain is that when an act is illegal, there is a strong reason to refrain from performing it; however, when an act is legal, there is not a strong reason to perform it (Kvalnes & Øverenget, 2012). Reflections on the phenomenon of loophole ethics point in the direction of a similar imbalance in the ethical domain. The fact that an act is singled out as unethical in a code of conduct provides people with a strong reason to refrain from performing it. However, in cases in which the considered alternative is not explicitly identified in the code as unethical, this does not provide people with a strong reason to perform it or indicate that it is ethically acceptable. When the American company Enron and the accounting firm Arthur Andersen collapsed at the beginning of this century, many of the decisions and behaviors leading up to it appeared unwise without actually being in violation of the code of conduct for the professions involved. In the aftermath, financial authorities and organizations for accountants and lawyers added ethical rules and regulations to cover up the loopholes that had been exposed. A former Enron accountant has admitted that the loophole mentality was dominant in their work environment. The professionals made sure to comply with the rule-based framework, but they found creative and dubious solutions not mentioned as unacceptable in the rules. “All the rules create all these opportunities. We got to where we did because we exploited that weakness” (McLean & Elkind, 2003, p. 142). Sims and Brinkmann (2003) have used the Enron collapse as an example of why organizational culture is more important than codes. Organizations, professions, and authorities face a common challenge in taking steps to avoid loophole ethics. One alternative can be to follow the example of the Norwegian Armed Forces in response to the winter bathing incident by relying less on detailed rules and more on personal judgment and practical wisdom. This approach does not allow the decision-maker to justify his or her actions simply by pointing to the fact that there are no rules explicitly defining the choice as wrong. In accounting, the strategy of adding new rules to make the overall code more comprehensive appears to have had the unfortunate side effect of practitioners believing that relevant, moral thinking has already been performed by the rule-makers. In the post-Enron years, there has been a discussion within accounting about the merits of a detailed, rule-based approach and a more general principles-based approach (Bailey & Sawers, 2018; Braun, Haynes, Lewis, & Taylor, 2015). Moral reasoning in organizations needs to strike a balance between written rules and codes on the one hand and wise personal and communal judgment on the other. Shorter and more general codes leave more room and flexibility for individual decision-makers to apply their own judgment to the case at hand. Such codes signal to decision-makers that they need to use their common sense and professionalism to figure out what is right and wrong in the situation they face. The problem with this approach in many contemporary organizations is that, apparently, common sense is not so common anymore. Morality tends to be more fragmented and disparate than it used to be, and codes of conduct are seen as the best tool to compensate for that. It cannot be taken for granted that people interpret and judge situations similarly and consider the same aspects of it to be morally relevant. Cultural, generational, and gender difference can add to the moral uncertainty. When top management in organizations have doubts like these, codes appear to offer the most promising solution. However, eagerness to compensate for an apparent lack of common sense and judgment can then create a foundation for loophole ethics, both in the ex ante sense of influencing deliberations about what one should do now and in the ex post sense of leading to dubious justifications and excuses for what one has already done.